Video converter software tools are widely used these days for personal and professional reasons. With the increase in devices that allow video shooting, the search for fully fledged video converter software has started long ago. It is important to know various facts related to the video converters so that one is able to get the best converter for himself. Before choosing a particular one, make sure it has at least all of the five below mentioned features. Firstly, it should have a user-friendly interface. Every user is not an expert in computer and video conversion techniques. Any software which is easy to understand and use will provide a better experience. It shouldn’t strike hard on the user’s sensibilities and put him in an over thinking zone. Otherwise, a lot of time would be wasted in learning A to Z features. Secondly, it supports the majority of input and common output video formats, all in one converter. The supporting input format should cover most of all video formats. Similarly, the supporting output format should go well with commonly used video formats. For instance, webvideofetcher.com, an online video converter can download widely used video formats like FLV, AVI, Mp3, Mp4, AAC etc. 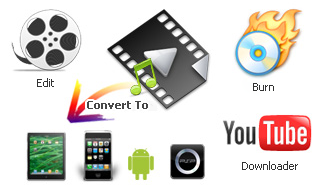 There are many video converter software tools which also support MKV, WMV, MOV, MPG, 3GP, AIF, and more. It should also support HD video conversion. Thirdly, video quality of the output is an important parameter. The video converters should deliver a quality of video output which is acceptable to most users. Due to formal attributes, the quality of formats such as 3GP may remain unchanged. Consequently, if any video converter tools can deliver quality output across AVI, WMV and HD, it is worthy of the user experience. Fourthly, the conversion speed should be time saving. Any quality video converter delivers high conversion speed. While searching, the user will come across different software tools with varied features. However, many of them would be a letdown in terms of speed. Time is valuable and there are certain software tools which shut down, sleep or even hibernates the machine once the job is done. It would be great to have something like that. Last but never the least, would be the customization of output. It includes merging and splitting video, batch convert video, adding subtitles etc. For instance, the user normally converts the files from a source video or audio. As a result, he or she needed to trim the files up to the section which is required. There are various video conversion tools which enable trimming the raw video to a preferable clip. Some even support cropping of the desired clip. Whether the process required to user to type or click is also important. If the start time and ending time can be directly set, it would be even better. Even a deer chase effort could hardly help in finding a one size fits all kind of video converter. It is better be sure of the type of files one has and the desirable video format needed.